What is a Recurve Bow? 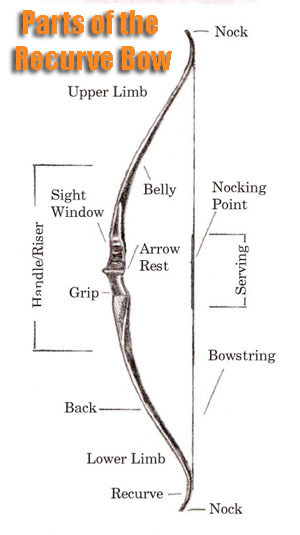 Long before compound bows became the bow of choice for most hunters, the recurve bow was king. This was because of the additional energy the recurve could muster compared to its predecessor the stick, or longbow. The recurve bow curves back, out, and back again (or recurves). When strung, the string touches a small section of the bow near the tips. The second curve goes against the natural curve and gives the bow more energy. A recurve bow stores more energy than a straight-limbed bow of the same weight, because energy is stored and delivered more efficiently, producing greater arrow speed. 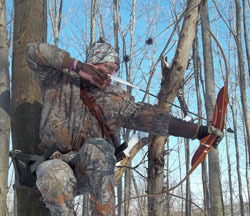 A recurve allows a hunter to use a shorter bow with greater arrow energy making the bow less cumbersome in brush and forest terrain. The recurve bow can be found between 48 and 70 inches long, typically around 66 inches and usually no less than 58 inches for stability. The "Basic" recurve bow, which is made of laminated woods, sometimes with opposing grains, glued together to achieve the shape and curvature of the bow. Common combinations of materials for limbs include fiberglass, laminated maple and fiberglass, and bamboo and carbon fiber. The "Takedown" recurve bow, probably one of the most popular variations, which can be disassembled for transport or storage. Several variations on limb attachment method exist, the most common being a limb pocket and bolts. Other attachment methods such as the pocket and locking system used on the Fred Bear Takedown have gained popularity over the years. The Brace Height is the distance between the deepest point in the Grip and the Bowstring. 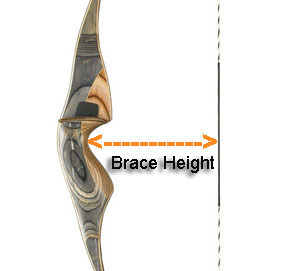 Brace Height is measured from the center of the bow grip to the bowstring at 90 degrees. Most manufacturers have different brace heights recommended for the bows they make. The ideal brace height for a bow is one that produces the quietest release with the least amount of vibration in the bow. Shoot a few sets of arrows at close range and note how the bow performs. Shoot another few sets arrows and note how the bow performs. Repeat these steps until the recommended maximum brace height is reached. Somewhere between the minimum and maximum heights, the bow should perform at its quietest and with least vibration. Where it does this, is the ideal brace height for the bow with this particular type of bowstring. Keep a record of this brace height for future reference. To help your shooting, the brace height must remain consistent. Any variation in distance will effect the arrow flight, so always check the brace height before shooting. Bowstrings stretch over time or broken strands can lower the brace height.